Motorola has explained why it's not stuck with the stock version of Android Ice Cream Sandwich on its latest handset, the Motorola Razr i. After Google acquired Motorola Mobility earlier this year, you'd be forgiven for thinking that the handset manufacturer would become a puppet for the search giant's mobile plans, but instead it's still trying to keep its identity. TechRadar spoke to Mark Notton, Motorola's Product Marketing Manager who said: "Moving to an open OS for the first time can be quite a daunting experience as there is a whole lot more you can do with the device. "We want to bring people on board and make it as easy as possible to setup the simple things." To address this easy-of-use challenge, Motorola has implemented its 'Circles' widgets on the homescreen of the Razr i, which gives users instant access to the clock, weather and battery info, as well as the settings menu and new message notifications. Motorola also implemented a new Quick Settings page, which it hopes will make it easier for the consumer to turn key features, such as Wi-Fi, on and off, plus it also offers homepage templates with pre-installed apps on them to aid in the setup of the Razr i. This means Motorola has had to stray slightly from the stock Ice Cream Sandwich offering, which is a breeze for experienced users to handle, but can still be a little tricky for those less in the know. Notton concluded: "We're focussing on fewer devices and less on the software and more on what the user wants." It's clear that Motorola is determined to continue to be its own brand and with the launch of the Razr i, and the large advertising campaign behind it, hopes are it will be able to get back on the consumer's radar as a top mobile brand once again. 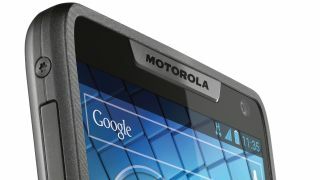 Take a look at our hands on Motorola Razr i review for more information and our thoughts on the handset.